Back in September, I was working on something and got tired of fishing the right pliers out of the pile on my workbench — flat nose for straightening bent component leads, needlenose for shaping leads, wire strippers, cutters, etc. So I made a dirt simple tool holder. 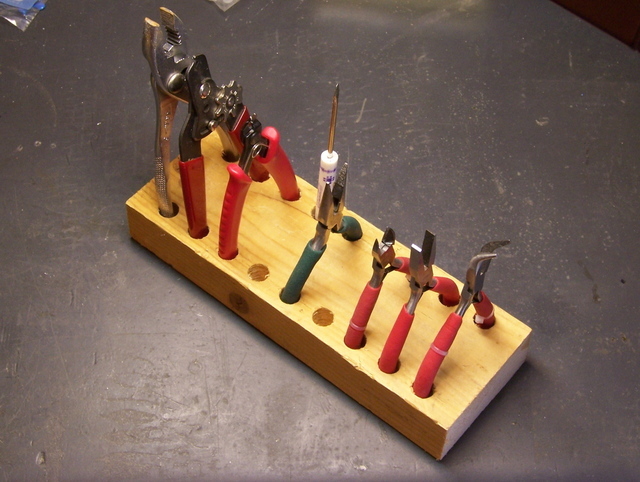 It’s just a 2×4 block with 1/2″ holes drilled in at regular intervals (Forstner bit makes nice flat bottoms), spaced for the at-rest width of my pliers handles and as close together as is easy to reach in and pluck out the one I want. It’s cleared up a significant mess on my bench, and it’s so fast and easy to access that I tend to put tools back between each use rather than each session. It’s ugly as can be, but I wanted to know how well it would work before making a pretty one. Problem is, now that enough time has passed for me to know it works well, I’ve lost some of my motivation to make it pretty. No LEDs. Nothing to do with electronics at all. Just wood. This is for Lawrence’s wife. I made a cherry rolling pin for Cort a couple of years ago; and when I described it to Gail, she was very interested. She said she preferred hers with a maple stripe in it, and I finished it yesterday. If you think cherry wood should be redder because that’s what you’ve seen in furniture stores . . . let me tell you that what you’ve seen bears as much resemblance to real cherry wood as a maraschino does to a real cherry: They’re both full of dye and completely unnatural. With exposure to light, this cherry will darken to a lovely, deeper brown shade within a few weeks, further highlighting the difference between the cherry and the maple. No bright red about it. I started a while back by gluing up the block. I have a large supply of short, narrow cherry and maple pieces from a long-lost high school classmate (who turns out to be Ron-the-TV-guy’s brother-in-law; lots of connections in a small town) who worked at a cabinet shop and got all the rails and stiles when they closed, then got tired of storing them and cheerfully sold them to me for a song. The cherry and maple were both flat-sawn, so they showed broad grain patterns on their faces and tight (boring) grain on the edges. I didn’t like the way the maple edge grain looked sandwiched between the cherry; so I sliced the maple into thirds, rotated the slender sticks 90°, edge-glued them back together to put face grain on the outside, and planed it flat again. Then I glued up the block — from the end, you can still see three maple squares sandwiched between two solid cherry pieces. And (like many of my projects), it then sat a while. This weekend I returned home from a conference, played a rock concert to benefit the high school robotics team, finished my obligations to the world, and finally had some time to myself. Electronics is great, but it’s awfully cerebral; and yesterday afternoon it was nice to give the mind a rest and do something visceral. I’m not a particularly good wood turner, and my results are due entirely to patience rather than skill, but I enjoy the process. I finally got to use the new roughing gouge that I got last Christmas, and boy, was it a treat. 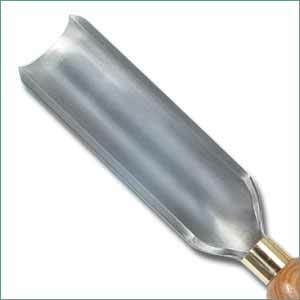 The little picture doesn’t do it justice — the gouge is huge, with a 2″ scoop shown in the picture. It cleaned up the blank quickly and with minimal chatter, and I was actually able to use it for the whole turning. I should probably have used a sharper tool at the end, because I had some slightly torn grain on the figured portions of the cherry, but it sanded out nicely. After sanding down to 1600 grit, I cut the ends free, removed it from the lathe, and started coating it with food-safe oil. I kept coming back to it all evening to add more oil, and I think I’ve put on about as much as it’s going to take right now. This morning, I got to re-experience one of the pleasures of woodworking with which non-woodworkers are probably unfamiliar: the wonderful smell of fresh-cut cherry still permeating my garage as I left for work. And yes, the smell of cut cherry is distinctly different than the smell of fresh-cut maple, oak, and walnut, and completely different than the smell of pitch from softwood (pine, fir). Schedule permitting, I’ll be able to take it to Gail tomorrow night. The Baldwin electronic organ I was trying to help repair has been demolished. Lawrence’s family was offered and retrieved another, more recent, in full working condition; and Jake dismantled the first one. By the time I learned of it, it was literally reduced to firewood and a pile of metal chassis, which he let me pick through. 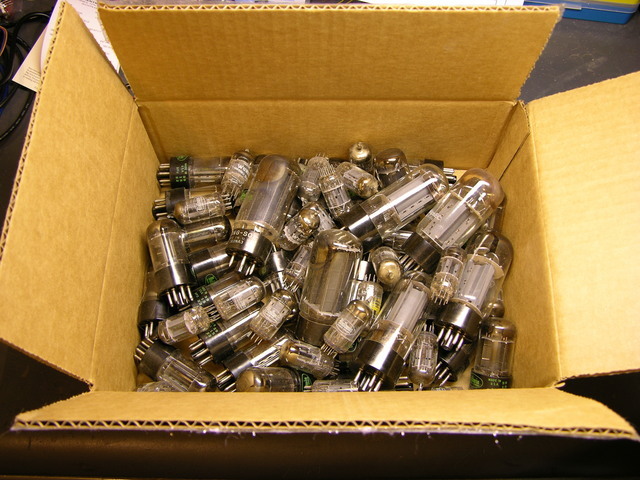 I came home with some sheet metal, some interesting resistors that I’ll photograph later, and a box of spare vacuum tubes to give away. Crazy Keith’s Vacuum Tube Giveaway!!! I’ve set my blog not to auto-post your comments, so your information will be seen only by me. I think there will be very little demand, so I expect I’ll be delighted to send them all to the first person who asks. But I’m going to be gone for two weeks; and to play fair, will evaluate all requests when I get back. If there’s more demand than I expect, I’ll lean toward charitable organizations like churches and museums, generally followed by anyone else on a first-come basis. US shipments only, please; or you’d better have a pretty good story about how easy and hassle-free it’s going to be for me to ship out of the country. I can’t find my tube tester, so I can’t tell you the condition of any of them. But the organ was working before it didn’t, so I suspect most of them are as good as one could expect them to be. 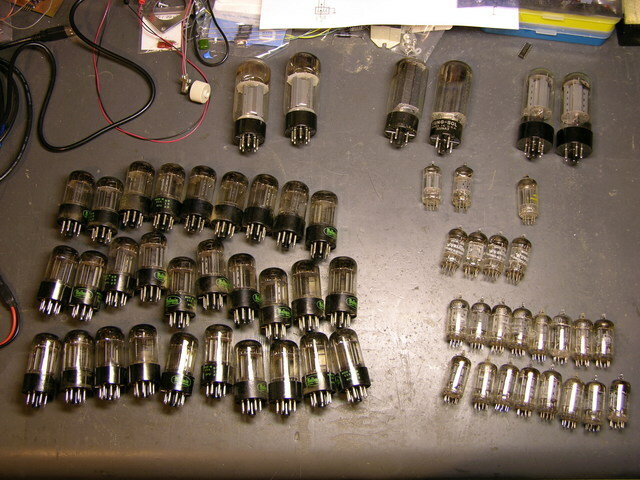 A reader advised that I should check prices on eBay, and I find that the tubes might actually bring some real money. I’m going to have to give this some thought — giving them away to a lot of different people versus putting money in Jake’s college fund. It’s not a foregone conclusion, and I’ll probably end up doing some kind of mix, so keep the requests coming. I haven’t got ’round to checking eBay yet; but all of the tubes are now spoken for if I do give them away, so I’m no longer accepting requests. Thank you all for your interest! I’d like a device that connects inline to the speaker output(s) on my home stereo amplifier between the amp and the speakers that has led indicators that flash with the audio signal that passes through the speaker wire. We have outdoor speakers on our “B” channel of the amp. On many occasions, we forget to turn them off, and I’d love some type of indicator that would be on/flashing when the speakers are in use. This would remind us to turn them off. 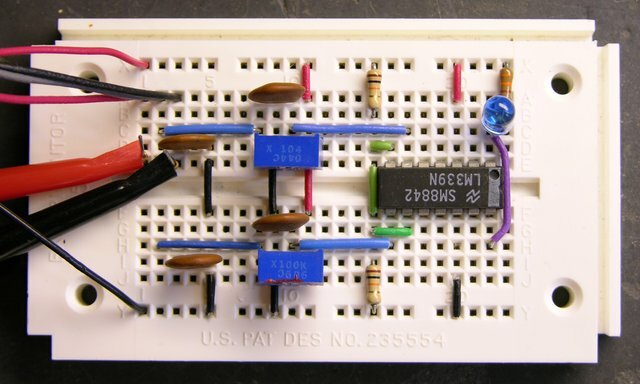 Any ideas how to build a device like this, or somewhere to go? It seemed like an interesting request, potentially useful to other folks, and easy enough to build. I’ve had a little time to play this week and hacked together a prototype, which I’ve posted here along with schematic, parts list, and build instructions. You are currently browsing the Keith's Electronics Blog blog archives for October, 2007.